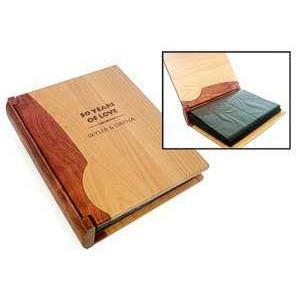 The Combo Wood Photo Album, crafted from Rosewood and Maple, holds up to two hundred 4 x 6 inch photos. This Photo Album arrives ready to laser engrave and includes the fixed photo insert pages for total convenience. Engraving on the Maple reveals a rich brown tone for excellent contrast. Price includes engraving on front face. Inside front and rear pages and back page engraving is extra. A great gift for weddings, anniveraries, retirements and family reunions. 7-5/8" x 9-1/8" x 2-1/4"